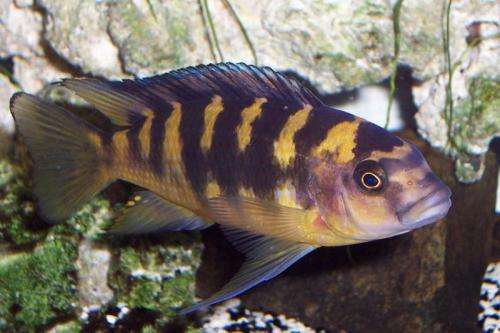 The bumblebee cichlid, Pseudotropheus crabro. Credit: Nicolas Couthouis / Wikipedia. (Phys.org) —Researchers from Oxford University in the U.K. have found evidence that suggests that cichlid fish evolved after the ancient Gondwana continent drifted apart, rather than before, as some have suggested. In their paper published in the journal Proceedings of the Royal Society B, the team describes how they compared found cichlid fossils with rocks known to have been a part of the Gondwana and also conducted DNA analysis to confirm that cichlid fish likely evolved approximately 65 to 57 million years ago—long after the continent came apart approximately 135 million years ago. Cichlid fish are plentiful in several parts of the world today: South America, Africa, India and Madagascar, all of which are believed to have once belonged to one giant continent known as Gondwana. For this reason, scientists have theorized that the fish evolved before the continent was torn asunder with various parts drifting to where they are today. Cichlid fish, they reason, live where they do today because they went along for the ride. This new research suggests that such earlier theories are incorrect—instead, it appears the fish evolved after the rifting and somehow made their way across the ocean. The researchers came to this conclusion by building a database with pertinent information regarding known cichlid fish fossils and then comparing that data with rock samples that have been identified as belonging to the Gondwana continent and that had other fish fossils embedded in them. The comparison suggested it was unlikely that other, older cichlid fish fossils existed prior to 45 million years ago, but had simply never been found. They followed that study up by conducting an analysis of gene mutations in 89 cichlid fish samples. Their results indicated that the fish species likely evolved sometime between 65 and 57 million years ago, long after the Gondwana continent was pulled apart. They suggest that the fish likely found its way across the oceans to settle on other continents, either by hitching a ride on some floating piece of debris or by following strong currents. They note that there are some types of cichlid fish that can tolerate salt water. There is also still a remote possibility that cichlid fish did exist prior to the breakup of Gondwana (leaving behind fossils) but they looked so different (due to evolutionary changes afterwards) that scientists don't realize they are the same fish. Cichlid fish: How does the swim bladder affect hearing?